Street Fair Sunday 8th March – enjoy the diversity and life of Newtown. 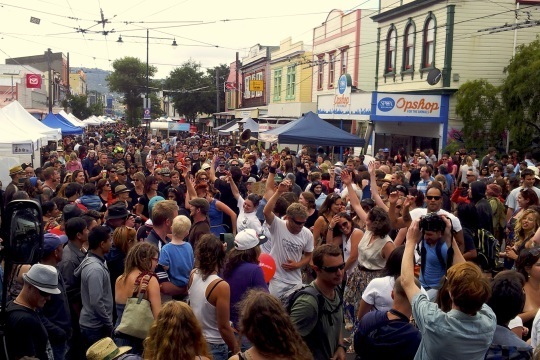 The focal point of Newtown’s Festival extravaganza is the Newtown Festival Street Fair from 9:30am on Sunday 8th March 2015. Check out the Fair Day programme and the performers who will entertain you. If you’d like a stall at the Fair Day, see our stall bookings pages. And find out about Road Closures in Newtown on Fair Day. Reclaim the streets and experience Newtown ! Enjoy the smorgasbord of 12 music stages, fairground fun, stalls and international food on the menu in Wellington’s festive suburb. Newtown is a community where everyday you can sample at any time a wide range of the world’s best ethnic foods, shop in the eclectic mix of local shops, or simply enjoy a great coffee in one of Newtown’s cafes, restaurants or bars. Be in the mainstreet of Newtown on Fair Day. Closed to vehicles, Riddiford Street is turned into a community party – the perfect opportunity for local groups, businesses & performers to showcase themselves to the public & for us all to celebrate Newtown. At this, the 19th Newtown Festival Street Fair, many of the local restaurants will be serving delicious food outside, supplied fresh from their kitchens. Newtown’s shops and local businesses will be joined by over 380 other stall holders & community groups selling an enormous range of goods, reflecting the diversity of the people who come together for this event. Stall sites fill both sides of the main street & into the adjoining side streets. A performance based street fair with live music, colourful costumes and dance all day entertainment is provided by community groups, local musicians and Wellington bands. The depth of talent in wider Wellington comes to our community for this once a year street party.